Learn to lead your congregation in holiday song with Favorite Synagogue Nigunim, featuring Sherwood Goffin, renowned cantor of Lincoln Square Synagogue in New York City, and faculty member, Belz School of Jewish Music at Yeshiva University in New York. 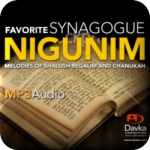 Favorite Synagogue Nigunim includes both musical tracks and audio instruction from Cantor Goffin, detailing the history of each track, the proper way it should be sung, and other tips. Retail price is $35, now offered at a special online discount. MP3 price below is to download the entire package, and CD price is to have the mp3 CD and software package shipped to you (price includes shipping).